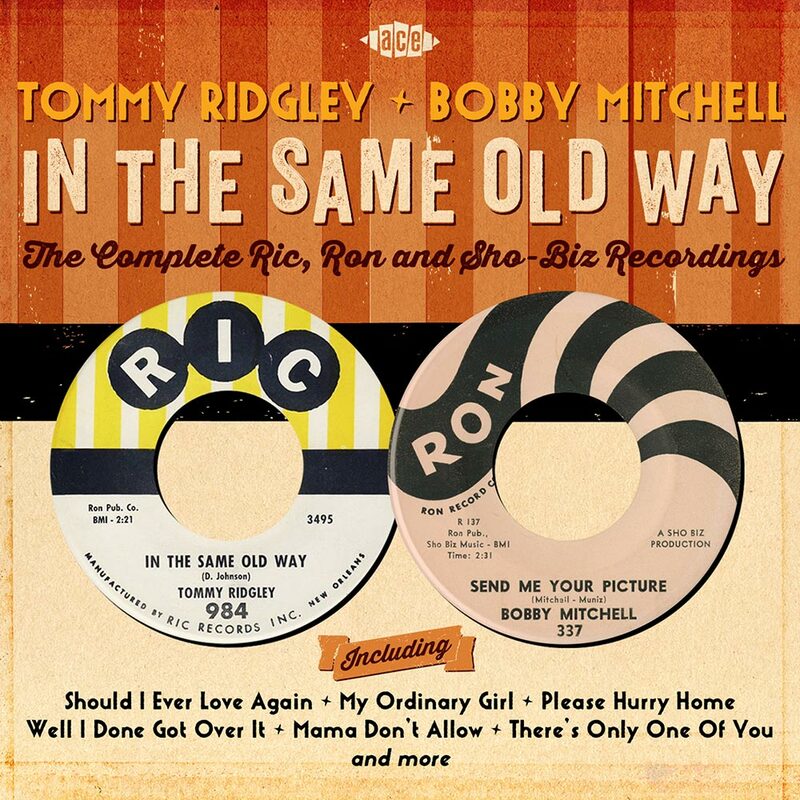 TOMMY RIDGLEY AND BOBBY MITCHELL-IN THE SAME OLD WAY: THE COMPLETE RIC, RON AND SHO-BIZ RECORDINGS. Although Joe Ruffino’s Ric and Ron labels may not have been the first R&B labels in New Orleans, they would become two of the most important and influential. That’s no surprised. Joe Ruffino was a music industry veteran. By 1958, Joe was ready to go it alone. So he founded two labels, Ric and Ron,which he named after his sons. They became a showcase for some of New Orleans’ most popular and talented R&B singers. Some of the the most successful were Eddie Bo, Johnny Adams, Joe Jones, Irma Thomas and Professor Longhair. However, there’s more to the Ric and Ron discography than a quintet of singers. Two other talented local R&B singers that signed to Ric and Ron were Tommy Ridgley and Bobby Mitchell. They recently featured on an Ace Records compilation, The Complete Ric and Ron and Sho-Biz Recordings. This twenty-two tracks compilations documents the singles Tommy Ridgley and Bobby Mitchell released for Ric and Ron, whose story begins in 1958. It was back in 1958, in New Orleans when Joe Ruffino founded his Ric and Ron labels. He named them after his two sons, Ric and Ron. While they were the Big Easy’s first independent R&B labels, they became two of the most important and influential. That’s no surprise, the man heading Ric and Ron was a music industry veteran. Previously, Joe had worked in the record distribution business. He’d been employed by the New Orleans’ distributor Record Sales. Joe had also worked with Johnny Vincent, who owned the Ace and Vin labels. They were based in Jackson, Mississippi. However, Joe was Johnny’s man in New Orleans. He looked after the companies’ interest. One way he did this, was by bringing new acts to Johnny. Two of these acts were The Supremes and Lenny Capello. However, eventually, Joe tired of working for other people. Now was the time to head out on his own. As a token of his gratitude, Johnny Vincent gave Joe some Ace masters. This would help Joe’s nascent labels, Ric and Ron. That would get Joe started. However, Joe was looking beyond releasing the Ace masters. Joe wanted to sign artists to his nascent labels. So he needed an an A&R man. They had to be the best that Joe Ruffino could find. Early on, Joe realised the importance of surrounding himself with talented people. So he went looking for the best person for each job. Not only did this include musicians, songwriters and producers, Ric and Ron’s A&R man, Edgar Blanchard. Just like Joe, Edgar Blanchard was a veteran of the New Orleans music scene. Edgar had been around since the forties. He was a talented guitarist and bandleader. However, Joe wasn’t signing Edgar to play guitar or lead his studio band. Instead, he was looking for someone who bring both established and up-and-coming local artists. It didn’t take long before Edgar signed Ric’s first artist, Al Johnson. Al Johnson only released two singles on Ric. His debut on Ric was You Done Me Wrong was released on Ric, in 1958. Two years later, Al released his best known song Carnival Time. It was written by Joe and Al and became Al’s theme song. After that, Al became known as Mr. Carnival Time. By then, things had changed at Ric. Edgar Blanchard left Ric. Filling his shoes wasn’t going to be easy. However, Joe Ruffino caught a break with the man Joe appointed as Edgar Blanchard’s successor, Harold Battiste. Joe Ruffino seemed to have the uncanny knack of appointing the right man. Surrounding himself with talented people, ensured that Ric and Ron had every chance of thriving. Competition was fierce, so Joe needed loyal and talented lieutenants. He found that in Harold Battiste was certainly that. He filled the void left by Edgar Blanchard. Harold Battiste took over from Edgar. With Harold Battiste onboard, Ric and Ron’s reputation grew. Suddenly, people started sitting up and taking notice of Joe Ruffino’s nascent labels. However, when Harold Battiste left, many thought that this would impact badly upon Ric and Ron. It didn’t. That’s because Joe Ruffino found a ready made replacement, in Malcolm “Mac” Rebenack, the future Dr. John. He was a guitarist, pianist, songwriter, arranger and producer. Mac was more than capable of filling the void left by Harold Battiste and played his part in the rise and rise of Ric and Ron. However, back in 1958, Joe Ruffino was slowly building up Ric and Ron’s roster. Midway through 1958, Joe added Johnny Adams to his roster. Johnny would release more singles on Ric and Ron than any other artist. His first single was I Won’t Cry, which became synonymous with Johnny Adams, who was one of Joe Ruffino’s most successful signings. So was another artist signed in mid-1958, Eddie Bo. Eddie Bo was one of the many talented piano players to come out of New Orleans. A talented singer, songwriter and pianist, Eddie not only enjoyed a solo career on Ric, but penned tracks for other artists. It seemed that Joe Ruffino was continuing his policy of signing talented and versatile artists. This was certainly true of Tommy Ridgley. Tommy Ridgley became the third male R&B singer to sign to Joe Ruffino’s labels. By then, Tommy was thirty-five. His career began in 1946, when he won a talent contest at the Dew Drop Inn in New Orleans. Soon, Tommy was making a name for himself locally, in New Orleans’ clubs. Then he joined the Bama Band, which was akin to Tommy’s musical apprenticeship. By 1949, Tommy was singing with Dave Bartholomew’s band. Then when Dave left, to become an A&R man at Imperial Records, he signed Tommy Ridgley. His first single was Shrewsbury Blues, which was the first New Orleans’ R&B record released on Imperial. It sold well, and resulted in Tommy releasing further singles on Imperial. In total, Tommy released six singles before parting company with Imperial in 1951. Not long after he left Imperial, Tommy Ridgley and His Orchestra released Tra-La-La on Decca. It looked like giving Tommy a hit single. However, Imperial thought they still had Tommy and his orchestra under contract. A contractual dispute followed. This contractual dispute resulted in Tra-La-La failing to fulfil its commercial potential. To rub salt into the wound, the Griffin Brothers Orchestra then released a cover. It was almost identical to Tommy’s version. Ironically, the Griffin Brothers Orchestra outsold Tommy’s version. Things would get worse for Tommy Ridgley and His Orchestra discovered they were under contract to Imperial until 1952. Once Tommy was free of his Imperial contract, he formed a new band, The Untouchables. They signed to Atlantic Records and recorded twelve tracks over the next eighteen months. Only two singles were released, and they never sold well. For Tommy, this period between 1952 and 1954 proved frustrating. The Untouchables had potential, but they never got the chance to show what they were capable of. Sadly, Tommy’s luck was out, in more ways than one. Following the end of The Untouchables’ contract with Atlantic, Tommy spent the next two years without a label. Then in 1956, Tommy signed Al Singer’s New York label Herald Records. His debut was When I Met My Girl. It gave Tommy a minor hit. Another five singles followed over the next two years. Sadly, success eluded these singles. 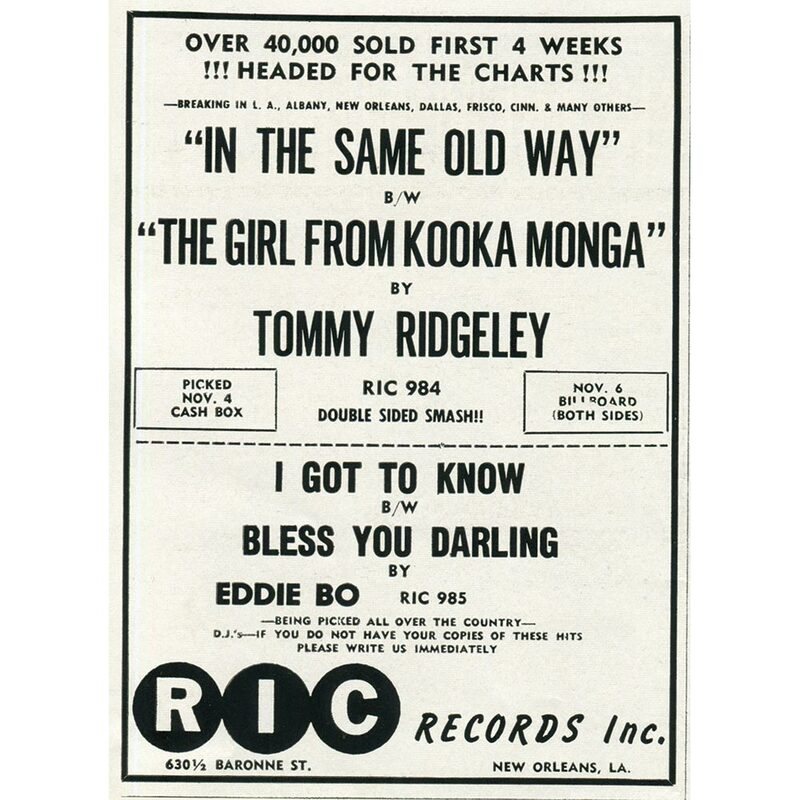 These singles were distributed by Ric, who Tommy Ridgley was introducing up-and-coming singers to. One of the singers Tommy Ridgley recommended to Joe Ruffino, was a young singer who occasionally sung one with The Untouchables. Her name was Irma Thomas, the future Queen Of New Orleans. Irma Thomas released two singles for Ric, before signing to their competitor Minit in 1960. By then, Tommy Ridgley had signed a contract with Joe Ruffino. So had a young singer called Bobby Mitchell. When Bobby Mitchell signed with Joe Ruffino, he was just twenty-five. He was ten years younger than his label mate Tommy Ridgley. However, Bobby, who was also a native of New Orleans, had been releasing records since 1953. Bobby Mitchell’s career began when his group The Toppers were signed by Dave Bartholomew, to Imperial Records. The Toppers were together until 1955, when the group ran its course. By then, Bobby was ready to embark upon a solo career. Like many artists, the early years of Bobby’s solo career are a case of what might have been. He released a cover of Nothing As Sweet As You. It was well received, but failed commercially. Then in 1956, Bobby enjoyed a hit with Try Rock and Roll, which reached number fourteen in the US R&B charts, That was as good as it got for Bobby Mitchell at Imperial. Early in 1957, Bobby released a cover of The Mills Brothers’ You Always Hurt The One You Love. Despite its quality, it failed commercially. So did I’m Gonna Be A Wheel Someday, which was released in December 1957. 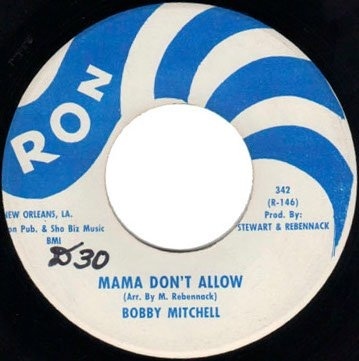 By then, Bobby Mitchell’s singles were hardly being promoted. It was as if Imperial had given up on Bobby. 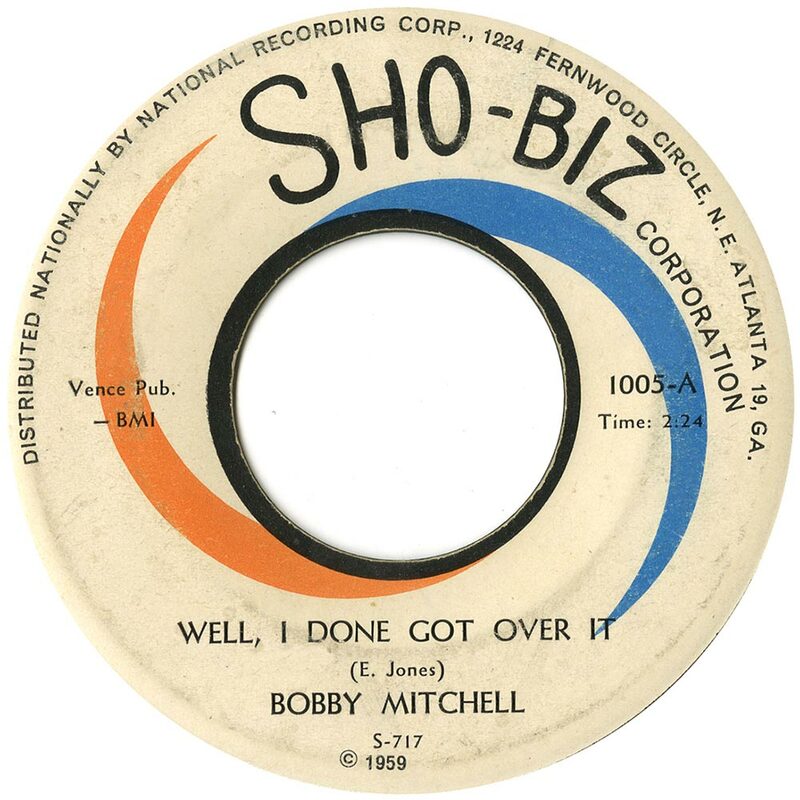 So Bobby signed to Sho-Biz Records in 1960. Sho-Biz Records was founded by Jim Stewart, the program director at the WWOZ radio station. This was a short-lived label and in 1960, Bobby Mitchell released Well I Done Got Over It as a single. On the flip-side was Just Say You Love Me. Both tracks feature on The Complete Ric and Ron and Sho-Biz Recordings. 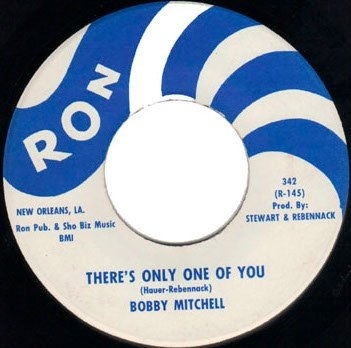 During his dalliance with Sho-Biz Records, Bobby Mitchell signed to Ron, where he and Tommy Ridgley who was signed to Ric. The two men enjoyed a friendly rivalry, and released another ten singles which feature on The Complete Ric and Ron and Sho-Biz Recordings. Their rivalry began in 1960. Having signed to Joe Ruffino’s Ric label in the spring of 1960, Tommy began work on his Ric debut. The song chosen was Is It True? 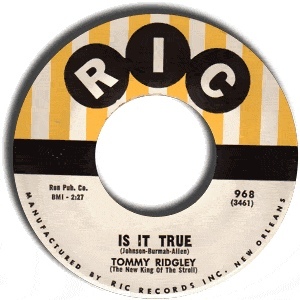 On the release of Is It True in April 1960, Ric billed their latest signing as “Tommy Ridgley The New King Of The Stroll.”Tommy lived up to the hype. He delivers a vocal tour de force, combining power and emotion. On the B-Side, was Let’s Try and Talk This Over, where Tommy deliver a needy, hopeful vocal. Despite the quality of both sides, Tommy’s Ric debut failed commercially. While Is It True was a success in New Orleans, it didn’t sell elsewhere. Given this was only Tommy’s Ric debut, nobody was worrying too much. Six months passed before Tommy Ridgley released the followup to Is It True in late 1960. The song chosen was Do You Remember, which was an another tale of heartbreak. The flip side was a cover of Please Hurry Home. Sadly, for Tommy, lightning struck twice. Do You Remember sold well locally, but wasn’t a success further afield. For Tommy this was disappointing. Just like Bobby Mitchell, 1960 was meant to mark the beginning of new chapter in his respective careers. Maybe it would be a case of third time lucky for Tommy Ridgley? For Tommy’s third single, and first single of 1961, a familiar song was chosen, Should I Ever Love Again. Four years previously, it had given Wynona Carr a hit single in 1957. Joe Ruffino was hoping lightning would strike twice. When Should I Ever Love Again was released in March 1961, Tommy did his part, and delivered a heartfelt cover of Should I Ever Love Again? 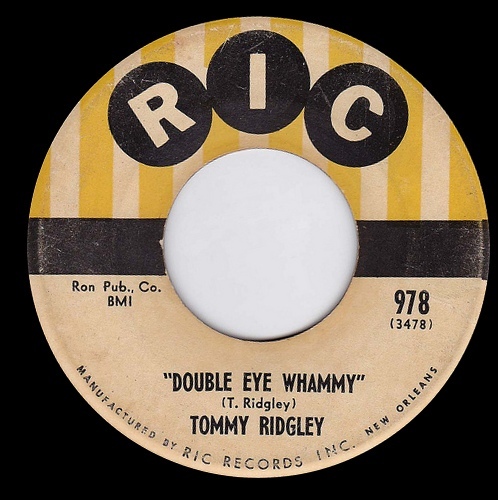 For the B-Side, a Tommy Ridgley composition Double Eye Whammy was chosen. It would later “inspire” Freddy King when he wrote Double Eyed Whammy in 1966. He gave Tommy a co-writers credit. Sadly, that was the nearest thing to success that Tommy’s third single got. Just like his two previous singles, Should I Ever Love Again which was a success in the New Orleans area, where Tommy was a star. However, outside of New Orleans, Tommy was almost an unknown. What didn’t help, was that Joe Ruffino didn’t have the budget to promote Should I Ever Love Again. For Tommy, 1961 hadn’t started well. Surely, things would get better? 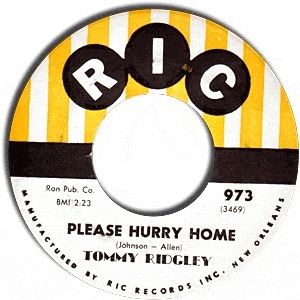 Four months later, in July 1961, Tommy Ridgley released his second single of 1961, Three Times. On the B-Side, was The Only Girl For Me. Just like Three Times, it was a Cornish and Smith composition. Tommy brought both sings to life, in his own inimitable style. While Three Times was popular in New Orleans, it was the old story. Beyond the New Orleans’ boundaries, Three Times failed to sell. That made it four consecutive singles that had failed commercially. Things hadn’t got any better. With success still eluding Tommy, Joe Ruffino and Tommy went looking for a song that stood a chance of giving Tommy that elusive hit. They thought they had found it, when the came across In The Same Old Way. 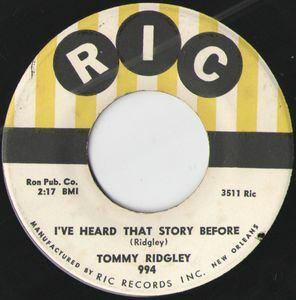 It became Tommy’s fifth Ric single, when it was released in November 1961. On the B-Side, was another song penned by Tommy, the The Girl From Kooka Monga. Despite the quality of both sides, In The Same Old Way was no more than a local hit. This was the fourth single Tommy had released during 1961. Although they had all sold well locally, that was as good as it got. For Tommy and Joe, this was a worrying trend? However, was Bobby Mitchell doing any better? 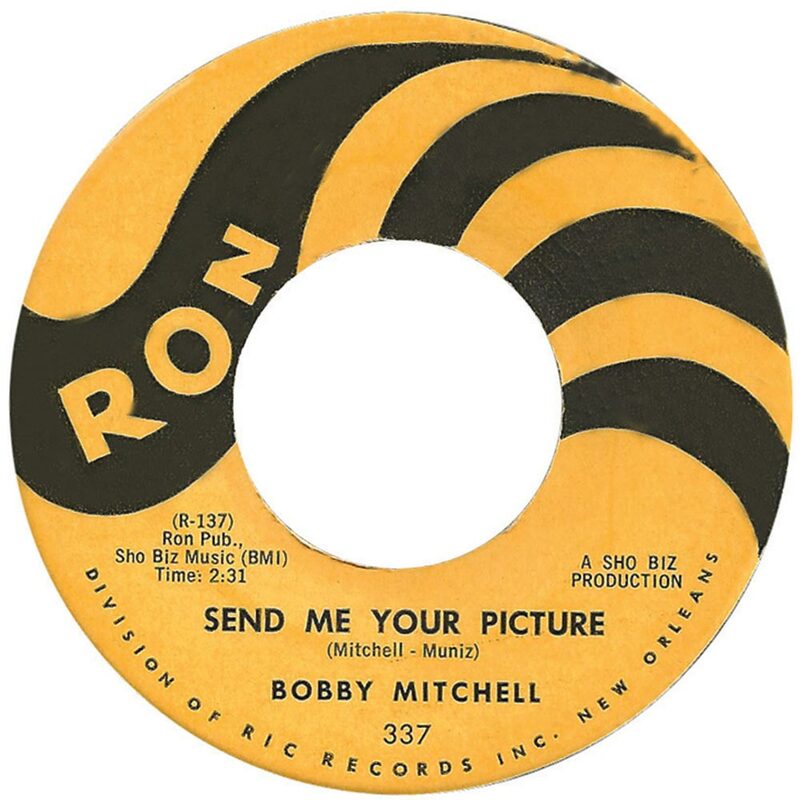 Bobby Mitchell was still signed to Sho-Biz Records in 1961. However, things had been tough for Bobby. Aged just twenty-five, he suffered a heart attack and took time to recover. However, by early 1961, Bobby was ready to release a new single. Jim Stewart, who owned Sho-Biz Records, decided to sell Send Me Your Picture to Joe Ruffino. This was a gamble. If the single was a huge success, this could prove costly. This was a risk Jim was willing to take. From the first time Joe Ruffino heard Send Me Your Picture, he thought the song had potential. So it was released as a single in early 1961. On the B-Side was You’re Doing Me Wrong. Both sides found Bobby Mitchell in fine voice. Especially on Send Me Your Picture, which Bobby’s wife penned. Joe Ruffino had high hopes for the single. Sadly, by the time Send Me Your Picture was released, Bobby was no longer performing live. Given his health problems, this deemed to risky. This hampered the potential success of Send Me Your Picture. It failed commercially. While it was popular locally, that was as good as it got. This Joe saw as a setback. He still believed in Bobby Mitchell. Six months later, and a followup to Send Me Your Picture was released. The song chosen was the heartfelt ballad There’s Only One Of You. On the flip side, was uproarious and rousing version of Mama Don’t Allow. Why it wasn’t chosen as the single seemed a strange choice. Especially when Send Me Your Picture wasn’t a commercial success outside of the Big Easy. For Bobby Mitchell this was disappointing, and brought to an end his relationship with Jim Stewart and Joe Ruffino. 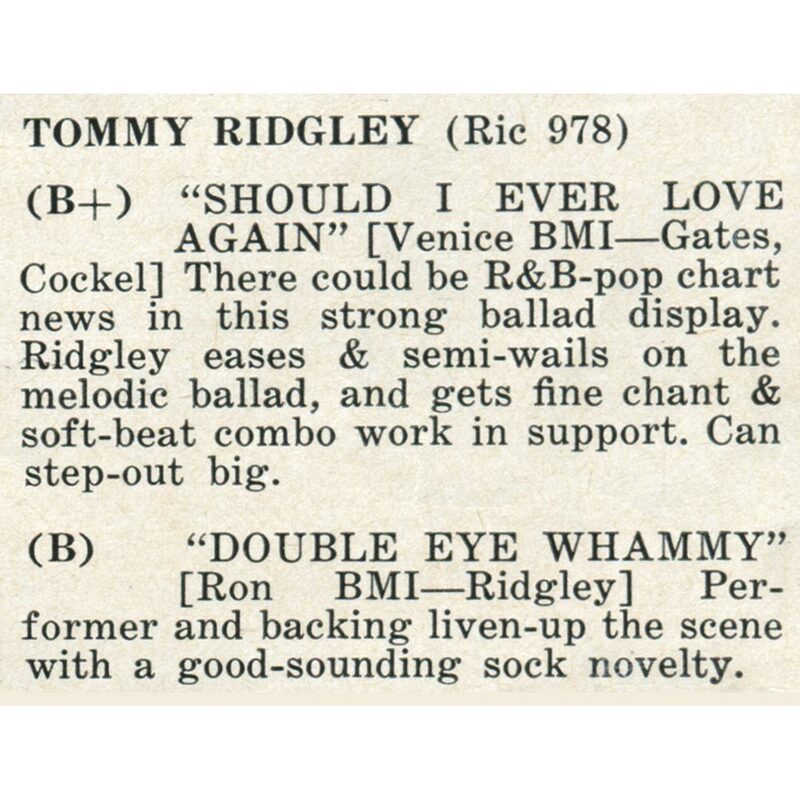 Tommy Ridgley however, was still going strong and looking for a hit. It wasn’t until July 1962, that Tommy released his sixth single. By then,Malcolm “Mac” Rebenack was Joe Ruffino’s new A&R man. He oversaw the recording of My Ordinary Girl, which was chosen as Tommy’s next single. It was written by Joe Ruffino. On the B-Side was She´s Got What It Takes. When My Ordinary Girl was released, nothing had changed. My Ordinary Girl sold well locally, but nowhere else. For Tommy and everyone at Ric this was disappointing. However, things were about to get worse. In August 1962, tragedy struck. Joe Ruffino died suddenly of a heart attack. Ever since he founded Ric and Ron, Joe had worked tirelessly. Now it seemed all the years of long days and hard work caught up with Joe Ruffino. His family and the wider New Orleans’ music community were shocked. With Joe gone, his two sons were left to run the Ric and Ron labels. They tried to follow in their father’s footsteps. That, however, proved impossible. Eventually, Joe’s brother-in-law Joe Assunto took over the running of Ric and Ron. By then, the Ric and Ron labels were on their last legs. For Tommy Ridgley, this was a disaster. Now Joe Assunto was running Ric and Ron, he had to try and pick up the pieces of Joe Ruffino’s mini musical empire. It wasn’t going to be easy. However, Joe was determined to do the best for his sister and nephews. Given all that had happened, it had been a while since Tommy Ridgley last released a single. He was still under contract to Ric. So, Malcolm “Mac” Rebenack got to work, Ge cowrote Heavenly, which was chosen as Tommy’s next single. On the B-Side was I Love You Yes I Do. However, it was a familiar story. Heavenly had potential, but Ric hadn’t neither the means nor the money to promote the single. For Tommy, his search for a hit went on. The only small crumb of comfort was that Heavenly sold well locally. However, that wasn’t going to be enough to save Ric. It was nearly the end of the road for Joe Ruffino’s two labels. Without him, the labels were a shadow of what they had once been. However, Joe Assunto wasn’t ready to call time on Ric and Ron. One of the final singles to be released on either label was Tommy Ridgley’s Ric swan-song I’ve Heard That Story Before. That was almost ironic, given so many of Tommy’s singles were going to be the one that gave him his big break. That wasn’t the case with I’ve Heard That Story Before, which featured a cover of Honest I Do on the flip side. Just like Tommy’s previous singles, they were successful locally, but nowhere else. It seemed that Tommy Ridgley was destined to never make it big outside of the Big Easy. The music industry like life, isn’t fair. For both Tommy Ridgley and Bobby Mitchell, it was a case of what might have been. Both men certainly had the talent to become successful singers. What they never got, was a break. Instead, hit singles eluded both Tommy Ridgley and Bobby Mitchell. That’s despite the quality of music Tommy Ridgley and Bobby Mitchell released on Ric and Ron. It should’ve found a wider audience. Sadly, that wasn’t the case. Maybe if Tommy Ridgley and Bobby Mitchell had been signed to a major label like Atlantic, or one of the larger independents like Stax, then they would’ve enjoyed the commercial success their talent warranted. Sadly, that wasn’t the case. Instead, commercial success eluded Tommy Ridgley and Bobby Mitchell. They’re the nearly men of Ric and Ron, who could’ve and should’ve enjoyed commercial success and critical acclaim. Sadly, that wasn’t to be. Fifty-two years after Ric and Ron closed their doors, Tommy Ridgley and Bobby Mitchell, Ric and Ron’s nearly men, are now perceived as two of the most underrated singers who Joe Ruffino signed. Their music is celebrated on Ace Records recently released compilation, The Complete Ric and Ron and Sho-Biz Recordings. This twenty-two track compilation documents and celebrates two singers who could’ve and should’ve reached greater heights than they did. They certainly didn’t lack talent. Far from it. Tommy Ridgley and Bobby Mitchell had that in abundance. That’s apparent on The Complete Ric and Ron and Sho-Biz Recordings which documents and celebrates the career of Tommy Ridgley and Bobby Mitchell. ← ANNELI DRECKER-ROCKS AND STRAWS.